An empirical investigation of the consistency of retrieval through Internet search engines is reported. 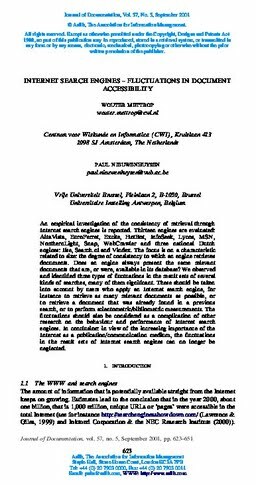 Thirteen engines are evaluated: AltaVista, EuroFerret, Excite, HotBot, InfoSeek, Lycos, MSN, NorthernLight, Snap, WebCrawler and three national Dutch engines: Ilse, Search.nl and Vindex. The focus is on a characteristic related to size: the degree of consistency to which an engine retrieves documents. Does an engine always present the same relevant documents that are, or were, available in its database? We observed and identified three types of fluctuations in the result sets of several kinds of searches, many of them significant. These should be taken into account by users who apply an Internet search engine, for instance to retrieve as many relevant documents as possible, or to retrieve a document that was already found in a previous search, or to perform scientometric/bibliometric measurements. The fluctuations should also be considered as a complication of other research on the behaviour and performance of Internet search engines. In conclusion: in view of the increasing importance of the Internet as a publication/communication medium, the fluctuations in the result sets of Internet search engines can no longer be neglected.